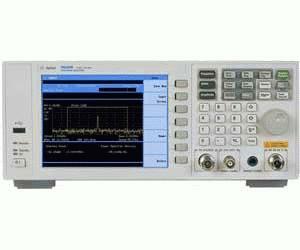 Regardless of whether your application is electronics manufacture, bench repair, RF education, or R&D projects, you need a spectrum analyzer that provides the essential functionality andÜperformance at an affordable price. The N9320B is designed to fulfill this requirement. The accuracy of frequency-selective power measurements when characterizing your products is very important. With a newly featured digital IF, the N9320B provides the measurement accuracy and speed youÜrequire to easilyÜaccomplish yourÜtasks. Power meter functionality is a standard feature built-in with the Agilent U2000 series power sensor support for highly accurate RF and MW power measurements. One-button power measurement functions offer channel power, ACP, OBW, SEM, and TOI measurements. For automated test programming, the N9320B provides industry standard SCPI language support and USB and LAN connectivity choices. SCPI code compatible with the Agilent ESA-L Series allows easy migration from the ESA-L to the N9320B. In your R&D, QA, or university research lab, you need measurement detailsÜabout your products and designs. The N9320B offers the best-in-class spectrum resolution. The 10 Hz minimum RBW distinguishes closely spaced signals easily, the -148 dBm DANL reveals low level signals clearly.ÜCombined with the 4-trace display and 12 markers, this lets you easily identify and compare signal details.